After the first performance of Gurrelieder in 1913, Schoenberg was asked if he was pleased by the apparent success of the work. He comments in an essay entitled: How one becomes lonely (1937). I was rather indifferent, if not even a little angry. I foresaw that this success would have no influence on the fate of my later works. I had during these thirteen years, developed my style in such a manner that to the ordinary concertgoer, it would seem to bare no relation to all preceding music. I had to fight for every new work; I had been offended in the most outrageous manner by criticism; I had lost friends and I had completely lost any belief in the judgement of friends. And I stood alone against a world of enemies. Schoenbergs anger at the success of Gurrelieder is understandable if one considers the rejection and dismissal by the musical establishment of the majority of the music he wrote during the 13 years after Gurrelieders initial conception. The implicit message is that the public would only accept a work, which was stylistically in the tonal language of Schoenbergs beginnings. The musical establishment did not accept his way of thinking and were generally unwilling to try to understand the music. Schoenberg recounts in several of his essays, how conductors and composers who were given his works, returned them complaining that they were incomprehensible. In 1909 he wrote to Richard Strauss: In Vienna I am at loggerheads with everything that goes on. I can only be amiable when I respect people; and so for this reason I only have a few friends in Vienna Strauss categorized Schoenbergs orchestral pieces as daring experiments in content and sound. It is evident on this occasion that Strauss did not comprehend the musical style and felt that it was too risky to launch them before the conservative audiences of Berlin. During the years leading up to the First World War Schoenberg was cut off from the public and demonised by critics to the extent that, when pieces were eventually performed, audiences came with predetermined responses. The behaviour, of what Schoenberg calls the small but active expert minority, clouded the judgement of what could have been impartial audiences. Schoenberg was not treated very sympathetically by what he calls, the generals, who today still occupy the musical directorates, in other words, the entire musical establishment. He writes how the first performance of his Sextet Verklärte Nacht in 1902 ended in a riot and actual fights. Similarly during the premier of the Second String Quartet in 1908, the audience disrupted the performance with outbursts of laughter and derision. Schoenbergs music became known for the scandals it produced rather than for its musical worth. He was tarnished with the label of modernism, which was seen as an affront to the great German tradition. Criticism of Schoenbergs music had a nasty malicious flavour which he often pointed out was not based on an actual understanding of the music. One of Schoenbergs students, Webern, writes that Only those blinded by envy and ill-willed could speak of sensationalism mania and the like. The question is, what motivated Schoenberg to continue to write even more radical music when he suffered from such isolation and rejection? In his theory of harmony, Harmonielehre (1911), Schoenbergs thinking about his own evolution and the emancipation of dissonance is coloured by his ideas on harmony. Schoenberg advocates a philosophy that seeks to balance emotional attributes such as notions of beauty and affection with mental logic. This he asserts with Balzacs statement that the heart must be in the domain of the head. Supreme art, he says, must show both these attributes. In the first chapter of Harmonielehre he talks of the danger of using aesthetic judgements based on one system of presentation that has no relation to the logic of the whole. Such judgments have more to do with common usage, and are dictatorial laws that do not follow the logical development of the principles that they are based on. Schoenbergs theory of harmony does not disallow the forbidden dissonances, and his explanation of dissonance certainly gives credibility to his arguments. It is ironic that it took until the publication of Harmonielehre for Schoenberg to be begun to be accepted. Schoenberg in Harmonielehre presents a theory of tonal harmony, which focuses primarily on the music of his predecessors, and not, as some might have expected, on atonality. Schoenberg proved to his opponents that he had a deep knowledge and understanding of the German tradition, and was not lacking in craft. In Harmonielehre Schoenberg explains harmony in terms of the harmonic series in which everything relates to the fundamental tone. I will define consonances as the closer, simpler relations to the fundamental tone, dissonances as those that are more remote, more complicated. The consonances are accordingly the first overtones, and they are more nearly perfect the closer they are to the fundamental. That means, the closer they lie to the fundamental, the more easily we can grasp their similarity to it, the more easily the ear can fit them into the total sound and assimilate them, and the more easily we can determine that the sound of these overtones together with the fundamental is restful and euphonious, needing no resolution. The same should hold for dissonance as well. Schoenberg states that dissonance and consonance are not opposites in a polarised sense, but are distinct in degree and not in kind. Carl Dahlhaus points out that Schoenberg treats the antithesis between consonance and dissonance as a compositional technique that is measured according to the purpose it was supposed to fill; if it proved to be superfluous then it could be abandoned. According to Schoenberg, dissonance can be comprehended as the relation of the more remote overtones to the fundamental. It is absorbed by the subconscious and analysed accordingly. It is easily conceivable that with some mental effort we can listen to complex music in terms of the tonal relations relationships that still exist despite a complete absence of the tonic. Here is established a very intimate reciprocation between melody and harmony, in that both connect remote relations of the tonality into a perfect unity, draw logical consequences from the problems they attempt to solve, and simultaneously make great progress in the emancipation of the dissonance. This progress is brought about here by the postponement of the resolution of passing dissonances to a remote point where, finally, the preceding harshness becomes justified. These early works show two very important principles of Schoenbergs thinking: roving harmony and developing variation. In Verklärte Nacht, there is a very fast rate of harmonic change, which is a product of the chromatic part movement. Schoenberg began to see the accompanying harmony in what he calls a quasi-melodic manner: a vertical projection of the horizontal presentation. As in Wagners Tristan and Isolde Schoenberg avoids resolution of harmony, and the resolution is only implied and not explicitly stated. The dissonant inflections that transformed the chords acted as pivots and enabled Schoenberg to modulate quite quickly into a whole sequence of distantly related keys, but retain a basic diatonic structure. Schoenberg took advantage of the properties of the fourths chord that has many resolutions and enables the music to modulate freely. Schoenberg was faced with a dilemma because the more he increased this chromatic colouring the more difficult it became to comprehend these diatonic functions. Schoenberg writes in My Evolution how the multitude of dissonances could not be counterbalanced anymore by occasional returns to the tonic. It became unacceptable to force a movement into that procrustean bed of tonality without supporting it by harmonic progressions that pertain to it. In Kammersymphonie Op. 9, Schoenberg used an even faster harmonic rate of modulation that progresses through all the keys of the harmonic spectrum in a space of time so fast, that it becomes difficult to define the home key. This led Schoenberg to make the decisive step in what he called the emancipation of dissonance and in the 4th movement of his Second String Quartet Op. 10 (1907-8) he abandoned tonality. The second important principle, which Schoenberg calls developing variation, is an aspect that spans his entire career. In his essay New Music: My Music Schoenberg states the fact that he says something once with little or no repetition. Exact repetitions he avoided and instead he used modified repetitions that created variation. He writes: With me, variation almost completely takes the place of repetition The technique of varying motives and phrases he quite clearly derives from the analysis of classical composers, and his text book on composition bares this out. The structural factors that Schoenberg derives from the principle of developing variation and non-repetition remain the same after his abandonment of tonality. In the tonal period works he compresses form, condensing the traditional four movements of the symphony into the framework of the sonata movement. In this way the internal repetition within movements is avoided, a principle perpetual development emerges, and the recapitulation is invariably varied. In the music of Schoenbergs atonal period, after the Second Quartet, he ran into further dilemmas. Schoenbergs music, without a tonal hierarchy relied entirely on motivic architecture and became increasingly aphoristic. Schoenberg, in his atonal period, was also faced with the problem of freeing dissonant chords from their tendency to resolve; even if notes are not present there is always a functional interpretation. In the atonal works from 1908 and leading up to the 1914-18 war, Schoenberg developed various techniques to overcome these problems. In the last movement of the Second String Quartet he used text to articulate the music material. This technique is brought to an extreme in the expressionist monodrama Erwartung (1909), which is like an extended improvisation in continuous recitative style where the music follows the text freely. This work abandons, in addition to tonality, motivic unity as well, and is athematic. The artist Kandinsky viewed line and colour as emotional effects and removed them from their descriptive function. Schoenberg does similar things with his music, which mirrors the extremely expressive content of the text. Schoenbergs intention in Erwartung was to represent in slow motion everything that occurs in a single second of maximum spiritual excitement, stretching it out for half an hour. Pierrot Lunaire Op. 21 (1912), for female vocalist and small ensemble, is a series of short satirical pieces that are sung in a speaking recitation called Sprechstimme. The poetry is in simple rondo and often repeats material but the music does not follow this pattern. Again, as in Erwartung, the expressive content of the text dominates the music, but we find repetition and some use even of traditional practices. Pierrot Lunaire is a retreat away from Erwartung, which is the extremity of the principle of non-repetition. The Three Piano Pieces Op.11, composed earlier in 1909, employ cell like constructions. The first of these is constructed from the cell that appears in the first few bars and by which Schoenberg derives all of his material. The pieces are aphoristic and gestural and one uses repetition in the form of ostinato. These techniques associated with the past are still a part of Schoenbergs thinking, but in most the music of this period Schoenberg appears to be interested in small aphoristic cell like constructions as apposed to large-scale structures. Ironically he had to search for a system of presentation that could sustain large-scale traditional forms. In his aphoristic music Schoenberg was increasing his tendency to use all the notes of the harmonic spectrum in a short space of time. The twelve-tone method that evolved from twelve note motifs, ironically provided Schoenberg with a procedure by which he was able to make structural differentiations, not unlike tonal music. He was able to return to the traditional structures of Bach, Beethoven and Brahms that he so well understood. The horizontal style of the classics, which implied in principle the construction of pure musical form changed gradually to a vertical style. This happened under the influence of the dramatization of the content, connecting music with direct psychological truth. Leon Botstein points out that the decisive step was the explicit severing of a long tradition of parallelism between musical form and structure and direct psychological truth.. A step to what Szymanowski describes as manifesting vertical sound as a value in itself, not as a function of musical expression, The decisive step to atomism was Schoenberg adoption of twelve-tone serialism, however Botstein traces it back to the Kammersymphonie Op.9, which he says alienated an audience that had used music to reinforce an internalised belief system. Botstein presents the theory that Schoenberg broke the parallelism between musical space and time and the real life sensibilities. 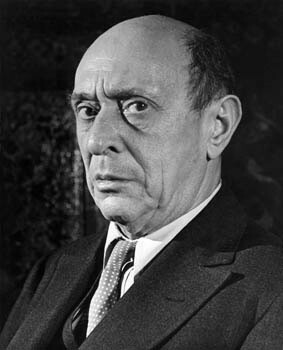 A very radical step away from pre-war attitudes that forced a critical and searching encounter with the present through music. Schoenberg does not shield his listener from serious internal dialogue, but represented a conscious desire to write music that presents intentional difficulties for the listener. Botstein places Schoenberg in the heart of a project of cultural and ethical restoration, not an act of aestheticist withdrawal. By removing the listeners expectation and withdrawing the reference points offered by tonality, Schoenberg shattered the listeners ability to hear psychologically. It is no wonder that the audiences who were used to certain conventions and belief systems felt their cherished ritual of culture was being destroyed Schoenberg rejected this response to music based on confusion and corruption of the arts. He writes in How one becomes lonely how he felt about composing after 1924 when his new serial method was being increasingly criticised. He was either described as a decadent romanticist or a dry constructor and there was no middle ground as always the most extreme opposites were used to describe his music. While composing for me had been a pleasure, now it became dirty. I knew I had to fulfil a task: I had to express what was necessary to be expressed and I knew I had the duty of developing ideas for the sake of progress in music, whether I liked it or not; but I also had to realize that the great majority of the public did not like it. This is quite a stark realisation of his position and we see from Schoenbergs writing that he felt bereft of an audience that had the sophistication needed to understand him. What comes across in his writings is not a political manifesto of new art, but his compelling sense of duty, which drove him to continue in the manner of thinking that promoted his enhanced awareness of the role and responsibilities of the artist. Schoenberg was not an isolated phenomenon and is important to stress the development in the other arts. The Expressionist artists painted a world of unease, guilt and foreboding, which is indicative of Schoenbergs Ewartung and Pierrot Lunaire. Schoenberg himself was a painter at the time of the conception of these works and had the opportunity to spend time with members of Der Blaue Reiter for a short time when he lived in Munich. With Kandinsky at their head, Der Blaue Reiter pushed the visual language of art into an abstract world that used colour as primarily an emotional effect and not representational. These developments owed a lot to the gathering pace of a war in Europe and the stifling atmosphere that this fostered. The impact of the war was to bring chaos, fear and anger, which had a huge psychological effect over people. Szymanowski writes how Schoenberg survived the war as a banner, an emblem, a representative of ideas which were to lead German music out of its pre-war suffocating atmosphere towards new achievements and conquests. There was the consciousness amongst the post world war generation that they had to push into the modern world so that the terrible reality of war would not be repeated. The same philosophy was held by the avant-garde composers of the 1950s who grew up during the horrors of the World War II. Schoenberg undoubtedly confronted the struggle with modernity at a juncture in history where Europe rapidly progressed into modern life and left behind the romanticism of past generations. Botstein, Leon. 1999. Schoenberg And The Audience in Schoenberg and his World. Edited by Walter Frisch. Princeton; New Jersey: Princeton University Press. Dahlhaus, Carl. 1987. Schoenberg and the new music. Cambridge: Cambridge University Press.